So the book itself says explicitly what we can expect to receive. We believe that the rewards on offer make it worthwhile trying to follow the principles it contains as closely as possible. This document is intended to help those who wish to do just that. Our experience is that every word of the Big Book (as the book Alcoholics Anonymous is affectionately referred to) is true. All the page references, unless otherwise stated, are from the Big Book. This document is not intended in any way as a replacement for the Big Book but simply relates detail of the application of the principles outlined in the Big Book. Therefore, while we have done our very best to ensure that what is contained does adhere strictly to the principles of the Twelve Steps, we do not see it necessarily as the only way that the Steps can be applied in recovery. Some may ask why there is little or no reference to the essays on the Steps contained in the book The Twelve Steps and Twelve Traditions of Alcoholics Anonymous (the “12x12”). When this book was published there was no suggestion that the Big Book was incomplete. The 12x12 was not published to meet a need in people’s sobriety. Each step essay was intended as a discussion around the subject, with experience of the step assumed. This places these 12 essays by Bill as interesting reading after the fact. We have found that if the 12x12 is used as an instruction manual it has more often proved confusing than helpful and has even lead to additional or alternative practices for which there is no hint or implication in the Big Book. AA has a suggested program “Our book is meant to be suggestive only.” (p164), but it is not a program of suggestions. It is suggested that we follow the program– a suggestion we can take or leave. But once we have made a decision to follow the AA program then there are a number of things that we must do — the word “must” appears many times in the Big Book — or else we are not doing the AA program. When it comes to the program we must try our best, but trying guarantees success. On most occasions, the suffering alcoholic is referred to as he. The writer is well aware that everything written applies as much to women as men and the hope is that it will be seen as useful by women as much as men. Unfortunately, the English language does not provide an elegant non-gender-specific reference to a single third person. I could have put “the alcoholic”, “he or she”, “she or he”, “they” or even “it”, I suppose. I did use some of these from time to time, but felt that it would be distracting for the reader to do so every time. In the end on most occasions I plumped for he. I had to pick one of them. So if some readers are offended by this I can only say that I hope that you do not let it distract you from the principles contained within the booklet, which are all-embracingly non-gender specific (and for that matter non-race, non-sexual-orientation, non-age etc specific). If you are not happy with this, I can only suggest that you pray for me. All prayers will be gratefully accepted. Our understanding is that the motivation for the 12x12 was to publish another book that could raise money for the fellowship. Bill W. went along with the idea was anxious to publicize the Traditions and at that stage there was little interest. In order to get the Traditions essays published (which are vital AA literature), he had to tack on the additional step essays. Trademarks. 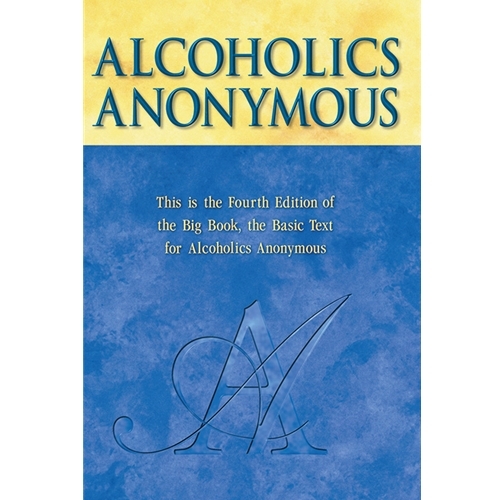 AA and Alcoholics Anonymous, and The Big Book are registered trademarks of Alcoholics Anonymous World Services. AA Grapevine and The Grapevine are registered trademarks of the A.A. Grapevine. We're not affiliated with GSO. This web site is not affiliated with the General Services Organization of Alcoholics Anonymous, or any particular AA group. It's just a couple of individuals who thought this kind of thing would be neat to have on-line. And neither are we affiliated to any other 12-step fellowship. We're not affiliated with other groups either. The Big Book web material is not associated with any organization or group of people. Alcoholics Anonymous is really strict about refusing to associate itself with anyone or anything. That refusal is a good thing, and we agree with it. Nothing you see here should indicate any kind of associations or relationships. As an organization, AA takes no position on outside issues. Flat-line budget. There is no money involved here. AA does not pay for this web site and is not compensated for allowing the material to be on-line.